We say that in Sweden when someone has achieved something. Welcome to insanity! I can see that the bug has got a hold of you already. you’re right, I am infected. But riding long distance is nothing compared to the insanity you usually have to face off the bike. I vote for motorcycling. 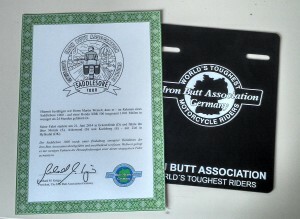 Congratulations and never fall asleep on the bike! You’re telling me? Very funny. It’s you who’s just done the Great Baltic Curve and turned down to ride back home with your friends. Wonder who needs to come to his senses.